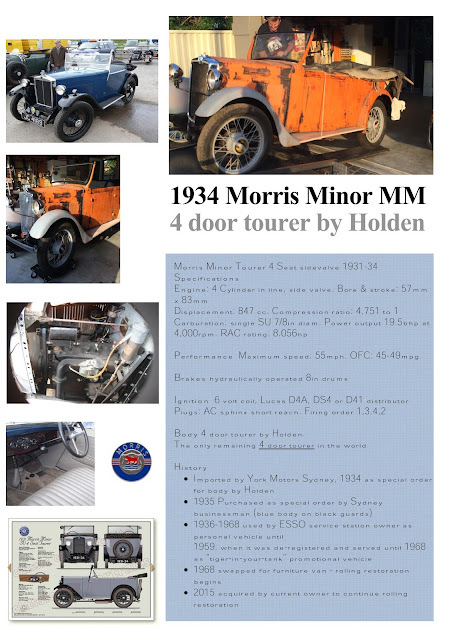 I bet you didn't know that the Morris Minor was a small 4-seater car with an 850 cc engine manufactured by Morris Motors Limited from way back in 1928 right through until 1934. The same name was resurrected for another newer car for the same market in 1948. This example of a 1934 Morris Minor, 4-door tourer, the last known one left in the world will be on the tiles of the Cronulla Mall this Sunday 19th March. The car is in 'as-found' condition as left by its 2nd owner. The car is complete and original. The chassis has been restored, and the original hydraulic brakes are currently being re-sleeved. Electrics and fuel are the next to be recommissioned with a goal of having the car ready for historic registration by late 2017. 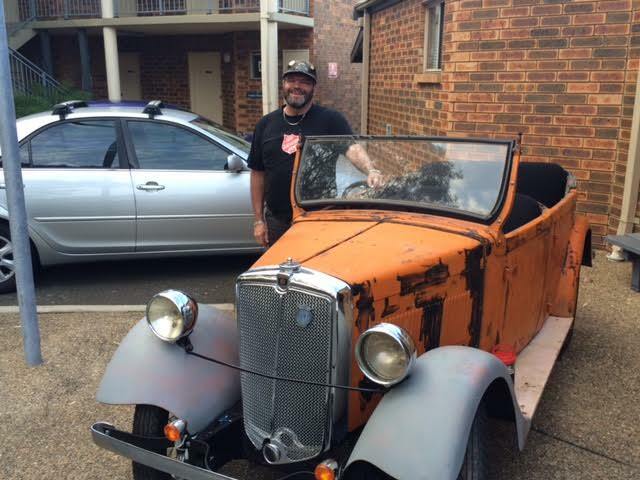 The car will remain with it's 'as found' second coat of tiger paint for some years to come. We intend to return it to the original colour scheme of deep blue over black guards by 2030.
full width bumpers at each end, etc. At first, the only body types offered were a 2-door fabric-bodied saloon and a four-seat tourer but during production up to a dozen different body styles were used. A big part of their success was that they were full-sized cars in miniature. The accommodation in the 2-door cars was described as "chummy" because of the unavoidable personal contact in the confined space.